In my never-ending battle with weight, I found myself wondering if we weigh more at sea level than we do in the mountains. We do. It’s not a lot, but it is physically factual. The science of it has to do with gravitational pull, which is what weight is, and the size difference between the entire planet and you. Pretty weird, huh? Another factor is that gravity decreases as it leaves the part of the planet with the greatest mass; in other words, the higher you are in altitude, the less you weigh. 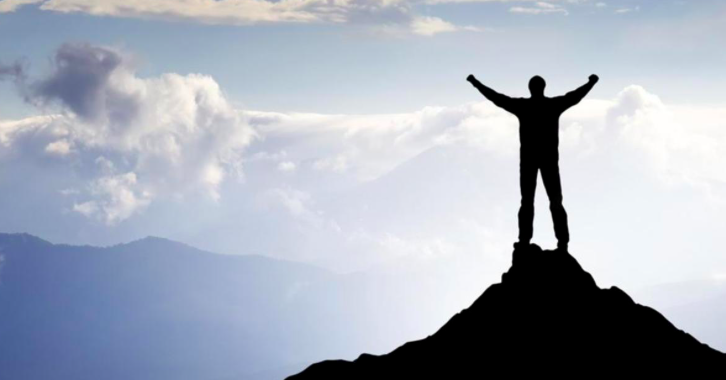 One estimate I found stated that a 150 lb person standing at 10,000′ above sea level (e.g. 500′ or so below the top of Vail Pass) would weigh 149.92 lbs. Not enough to tighten the belt, but another good reason to be in the mountains. You’re Invited to Help Celebrate Our Fifth! 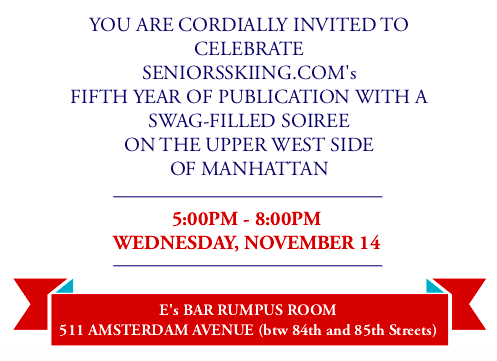 We’re hosting a party to celebrate SeniorsSkiing.com’s fifth publication year. It will be on Tuesday, November 14 on the Upper West Side of Manhattan. Lots of neat raffle prozes (e.g. 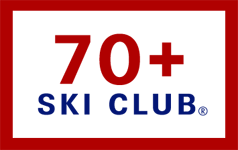 ski trip to Stratton from 70+ Ski Club; APEX boots; Orsden ski parkas, DeBooters, Bootsters, etc.) plus food and SWAG. Click here for the full invitation and RSVP link. Squaw Valley | Alpine Meadows reports that electricity will be sourced from 100% renewable resources, thus reducing its carbon footprint by 49%. In a related green initiative, the resort is increasing convenient parking facilities for carpooling customers. Tahoe Donner: New triple chair replacing the original double from 1971. Mammoth Mountain New daily, year-round non-stop service from LA on United, starting Dec. 1; new daily, seasonal non-stop service from Denver on United, starting Dec. 19; and new seasonal non-stop service from Orange County on JetSuiteX. Arapaho Basin: New four-person Beavers chairlift will access 468-acre expansion into Beavers and Steep Gullies. Copper Mountain: Two new chairs at Center Village. American Flyer will now be a high speed six-person chair with bubble enclosures, the only active bubble chair in Colorado. American Eagle will be a high-speed combination lift featuring six-person chairs and eight-person gondola cabins. Loveland: Inaugurating Chet’s Dream, the first high-speed quad in Loveland’s history. Silverton:Introducing new heli-skiing terrain, featuring diverse high-alpine terrain and early-season snow. Area also is expanding its Unguided Season Pass to include a 150 percent increase in available ski days to the unguided season. Winter Park: Features a new 10-person gondola, the resort’s first new lift since 2007. 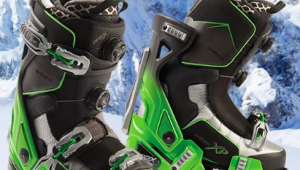 Wolf Creek: New high-speed, detachable quad, the 10th lift in its system. Mont-Tremblant: A new high-speed quadon the North Side will boost capacity to 600 per hour. Killington: New 6-person high speed bubble chairlift and new lift service at South Ridge. Magic Mountain: New base-to- mid mountain double chair. Stratton: New high-speed quad will reduce ride time from 14 to five minutes. Safe Descents is an affordable ski insurance plan providing coverage for transportation costs associated with accidental injuries sustained while skiing, snowboarding, riding a lift, and participating in a lesson within a resort. It cost $4.75 per day or $56.99 per season.